We start with equipment that is designed to meet world class standards, both in durability and reliablility, followed by world class international components common to the USA Markets. We are your national source for your construction equipment, and will do everything we can to earn your business. 550 West Trout Run Rd. 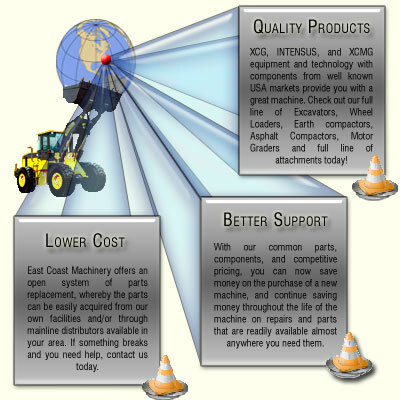 East Coast machinery has just unveiled its new website. Be sure to check out all the new products! Copyright 2007 © East Coast Machinery. All rights reserved. Site Design by Custom Computer.